In winter the Turnstone has dark brown and black upperparts, a brown and black breast band and a brown and white marbled head. 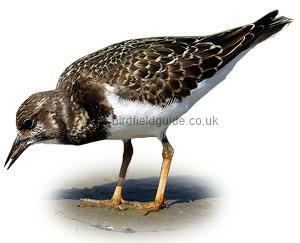 The Turnstone gets it's name from it's feeding habit of flicking small stones over to find small creatures. Turnstone's frequently feed on piers and promenades, where tourists drop chips and other morsels. They can become incredibly tame, often running in between peoples feet when feeding. 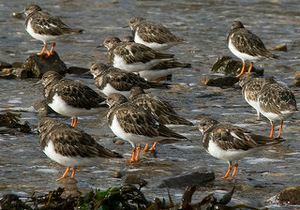 Note the bright legs of these Turnstone in winter plumage, the brown backs, breast band and head, make it a distinctive bird. 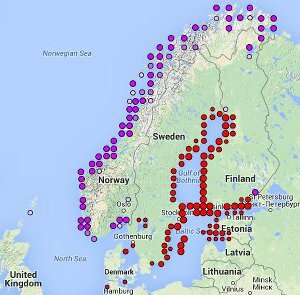 Breeds on the rocky coasts of Scandinavia. Non-breeding and winter birds can be found throughout Europe. 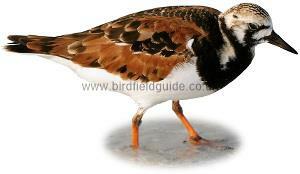 In winter, the Turnstone can be found on a variety of coastlines from sandy beaches to rocky headlands. Note the bright legs of this bird, the mottled head of this bird indicates the bird is in moult. 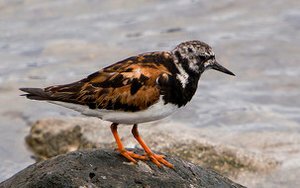 The Turnstone in summer plumage is a bright striking bird, with it's chestnut back, black and white markings and orange legs.